The City of Edmonton is once again holding Big Bin Events across the city this summer from May until mid-September. The closest event to the Inglewood neighbourhood is at Woodcroft Community Centre (13915 115 Ave NW) on June 9 and 10, from 9 AM to 5 PM. Remember to secure your load properly with a rope and tarp (guidelines can be found here). Big Bin Events allow residents to dispose of household items too large for regular collection at no charge. Materials that will be accepted include furniture (couches, chairs, mattresses); appliances (fridges, freezers, washers); and household electronics (computers, televisions). Appropriate materials will be recycled. For a full list of items accepted, please visit the City of Edmonton website. Please note that commercial waste and household hazardous waste are not accepted. Household hazardous waste can be taken to an Eco Station at no charge. For a list of these items, please click here. If you have items that are in good condition and can be reused, you can donate them. 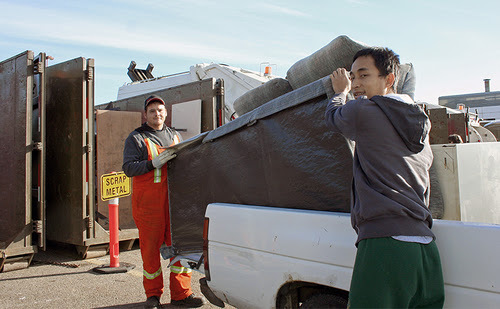 A list of items can be found at the City of Edmonton Reuse Centre website and a list of charities and businesses can be found here. In 2017, 11,322 customers disposed of 1,277 tonnes of large waste items and 488 tonnes of recyclable items during Big Bin Events. For a full list of Big Bin Event locations, dates and instructions, please click here.